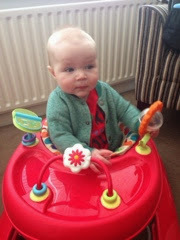 This is my boy at six months old - He seems to be growing at an alarming rate and it's fun to watch but scary all the same that time is passing so quickly. He has started to shun sleep during the day, preferring to fall asleep on me rather than in his cot. Great for him, nice sometimes but a bit difficult with a unruly three year old in the mix. Cub wants to walk and isn't happy laying down any more, he now sits unaided but still falls if he is tired. More than anything he is happiest on his feet. His sister is his world, he tries to touch her hair at every opportunity and laughs if she even looks at him. She in return seems to be thawing towards him and wants him to sit in the back of the car with her and she sometimes holds his hand. A real improvement. A new sound he is making is "ga ga" and he also now moans a lot too. It seems almost constant! On that note, I'm hoping its teething that makes him moan as we now have two bottom front teeth of which I'm immensely proud. His preference is always to have his legs up and arms behind his head. A proper little lad.